c.4 BC Birth of Jesus Christ, in Bethlehem. c.30 AD Death of Jesus Christ. c.33 Pentecost and the coming of the Holy Spirit (Acts 2). Sometimes known as the Birthday of the Church. c.33 Stephen – First Christian martyr (Acts 7). c.48 Council of Jerusalem (Acts 15). Gentile Christians accepted alongside those in the Jewish tradition. c.60 First Gospel published (often thought to be that written by Mark). 62 Martyrdom of James, “The Lord’s Brother”. c.67-68 Apostles Peter and Paul* martyred in the reign of the Roman emperor Nero. 70 Jewish rebellion against the Roman empire ends. Destruction of the temple in Jerusalem. From 70 Centre of Christianity moves to Antioch, Alexandria and Rome. c.90 Book of Revelation and Gospel of Saint John written. 161-80 Widespread persecution of Christians under Roman emperor Marcus Aurelius. (Severe persecutions also occurred under the emperors Decius (249-251) and Diocletian (284-305)). 301 Armenia becomes the world’s first country to officially adopt Christianity as the state religion. ‘In hoc signo vinces’ : ‘By this sign conquer’. Defeats rival Maxentius at the Battle of Milvian Bridge. 313 Edict of Milan issued by Constantine – Christianity becomes a legal religion within the Roman empire. 325 Constantine calls the first ecumenical council at Nicea. 367 Saint Athanasius is the first to list all 27 New Testament books in his festal letter. 381 Ecumenical Council at Constantinople revises the Nicene creed to its current form. c.382 Saint Jerome begins a translation of the Bible into Latin. 397 Synod at Carthage ratifies the 27 books of the New Testament as sacred scripture. 431 Ecumenical council held at Ephesus refutes Nestorianism. (The doctrine that Christ was two persons (one human, the other divine) in one body). Mary is declared Theotokos i.e. ‘God-bearer’ or more commonly, ‘Mother of God’. 451 Ecumenical council at Chalcedon affirms Christ as having two distinct natures united in one person (known as the ‘Hypostatic Union’). 553 Ecumenical council at Constantinople affirms teaching of previous councils. 589 To refute Arianism, the filioque (Latin: ‘and the son’) was added to the Nicene-Constantinopolitan Creed at a council in Toledo. 641 Capture of Alexandria and subesquent conquest of Egypt by Muslims. 663 Emperor Constans II is last Eastern emperor to set foot in Rome. 680-81 Ecumenical council at Constantinople rejects Monothelite heresy of one will in Christ. 787 Ecumenical council at Nicea ends the controversy over the use of icons in worship. 843 Triumph of Orthodoxy occurs on first Sunday of Great Lent, restoring icons to churches. 861 Cyril and Methodius begin their missionary work among the slavic peoples. 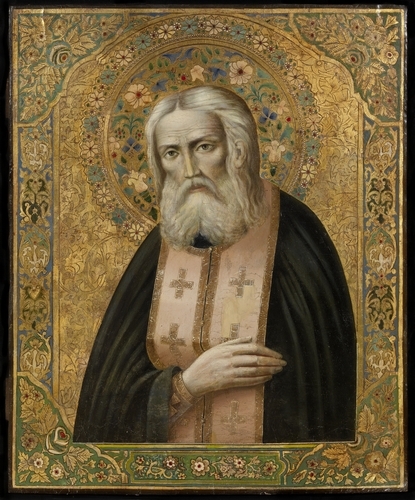 867 At a council held at Constantinople, Patriarch Photius declares Pope Nicholas I anathema following conflict over missionary work in Bulgaria and the filioque. 879-880 Ecumenical council at Nicea – confirms Photius as patriarch and rejects the filioque. 885 Mount Athos obtains political autonomy. 988 Conversion of Prince Vladimir in Kiev. Growth of Christianity in Russia. 1014 Use of the filioque for the first time in Rome, by Pope Benedict XIII. 1054 Great Schism – Eastern Orthodox and Western Catholic churches separate. 1084 Capture of Antioch by Seljuk Turks. 1095 Pope Urban II authorises the first Crusade to recover the Holy Land from Moslems. 1187 Jerusalem recaptured by a Moslem army led by Saladin. 1204 Sack of Constantinople during the fourth crusade. 1261 End of Latin occupation of Constantinople and restoration of Orthodox patriarchs. 1269 Orthodox patriarch returns to Antioch after a 171-year exile. 1274 Second Council of Lyons held, proclaiming union between the Orthodox East and the Roman Catholic West, but generally unaccepted in the East. c.1341 Defence of Orthodox spirituality by Gregory Palamas. Rise of Hesychasm. 1410 Iconographer Andrei Rublev paints an icon depicting the three angels who appeared to Abraham and Sarah, the angels being considered a type of the Holy Trinity. 1439 Ecclesiastical reunion with West attempted at Council of Florence, but subsquently fails. 1448 Independence of Russian Orthodox Church from the Church of Constantinople. 1453 Fall of Constantinople to the Ottoman Turks. 1568 Pope Pius V recognizes four Great Doctors of the Eastern Church, John Chrysostom, Basil the Great, Gregory of Nazianzus, and Athanasius. 1698 Consecration of the First Orthodox Church in China. 1794 Orthodox Missionaries arrive in Alaska. 1965 Mutual anathemas of 1054 between Roman Catholic and Orthodox churches lifted. 2008 Pan-Orthodox meeting in Constantinople. 2008 Publication of the Orthodox Study Bible. * See the Timeline of Paul’s ministry for more information.